Goaltender Miikka Kiprusoff's recent success has kept the Calgary Flames afloat in the crowded Northwest Division. Kiprusoff now looks to help the Flames regain sole possession of the division lead when they conclude their season series against the Nashville Predators on Friday at Pengrowth Saddledome. Calgary (35-23-9) won the opener of its three-game homestand, beating Columbus 1-0 on Tuesday. Kiprusoff turned aside 39 shots for his 26th career shutout, and Craig Conroy scored as the Flames improved to 6-1-1 in their last eight games. "He was our best player," Flames coach Mike Keenan said. "Everybody in the building knows that. Certainly he made the difference for us. He kept us in the game when they were really pushing early and then he was just stellar throughout the game from start to finish." Kiprusoff, who was able to shake off a tough outing in Friday's 3-1 loss to Anaheim, is 4-1-1 with two shutouts and a 1.30 goals-against average in his last six starts. He has won three of his last four home games to improve to 17-10-8 at Pengrowth Saddledome, where he posted an NHL-leading 28 wins in 2006-07. Kiprusoff has also been in net for the Flames' three matchups with Nashville (34-26-8) this season, going 2-1-0 with a 3.00 GAA in those appearances. He made 23 saves in a 3-0 loss at Nashville on Jan. 15 in the most recent meeting. 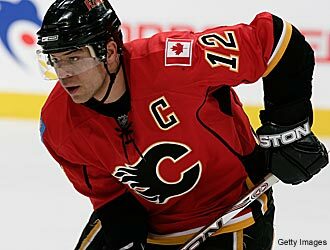 Captain Jarome Iginla is one goal shy of becoming the Flames' all-time leader in that category. He has 364 goals in 10-plus seasons with the team, tying him with Theo Fleury. Iginla, third in the league with 40 goals this season, has 18 goals and 37 points in 31 games against the Predators, including three goals and two assists in 2007-08. The Flames, who are tied with Minnesota for the top spot in the Northwest, will try to win the season series from the Predators for the first time since 1999-2000. Nashville, meanwhile, looks to avoid losing three straight on the road to the Flames for the first time since going 0-2-2 with a tie in Calgary from Feb. 4, 1999-Jan. 11, 2001. The Predators fell to 2-2-0 on their season-high, six-game road trip following a 6-2 loss to Vancouver on Thursday. The defeat moved the Canucks into a tie with Nashville for the eighth and final playoff spot in the Western Conference. Nashville trailed 4-2 after the first period and was unable to score again after totaling 28 goals in the previous eight games. "We got it handed to us tonight," said defenseman Greg de Vries, who scored his third goal of the season. "That's not the way we play, especially against these guys." Goaltender Dan Ellis gave up three goals on 11 shots in just over six minutes before he was replaced by Chris Mason, who finished with 30 saves. "They were all over us," Mason said. "I don't know if we showed up for the magnitude of the game." It is unknown which goalie coach Barry Trotz will start on Friday. Mason is 2-2-1 with a 3.21 GAA in six games against the Flames, while Ellis' lone appearance against Calgary was a relief effort in a 7-4 home loss on Oct. 13. Jason Arnott, the Predators' leader with 63 points, had his six-game point streak (four goals, five assists) snapped on Thursday. He has 23 goals and 42 points in 45 games against the Flames.